EDITORS NOTE: This is part of a series of interviews, conducted via email, profiling directors who have films screening at the 2008 Tribeca Film Festival. Carlos Carcas‘ “Old Man Bebo and Faramarz K-Rahber‘s “Donkey in Lahore” are both screening in the World Documentary Competition at the 2008 Tribeca Film Festival. “Bebo,” a Spanish doc, follows the career of legendary musician Bebo Baldes, a key figure in the development of mambo. 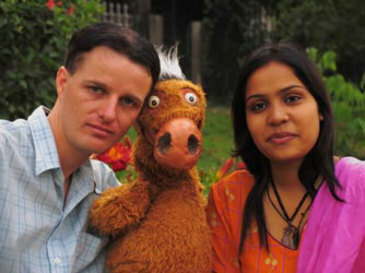 “Donkey,” from Australia, details couple Brian and Amber, who are tested when Brian has to convert to Islam to marry Amber. Both directors talked to indieWIRE about their films and their expectations for Tribeca. In the Tribeca catalog, TFF programmer Garrison Botts writes that “Bebo struts his stuff in several mesmerizing performance clips in this film. At the end, he plays a beautiful rendition of ‘Old Man River’ as we watch a montage of images from his long and rich life. It is a moving testament to Bebo’s talents and endurance. Then in New York in 2004, during the recording of “Suite Cubana,” I saw him stand up from the piano to conduct the band with a tremendous smile on his face. At that moment, as I was shooting, I thought about a man who had left Cuba during its heyday and had vanished to the Arctic Circle, spending the next 40 years playing in Sweden’s hotel lounges. He had written those pieces of music for fun. Never in his wildest dreams did he imagine that someday he would be in Manhattan with that supergroup of New York’s all-stars before him playing that music. This entire lifetime sequence flashed across my mind in less than a second, and that’s when I knew I had to put together the film. The first part came naturally, simply being a witness to the recording sessions. I started shooting music during “Calle 54,” and one of the cameramen, Jimmy Glasberg, told me, “Shoot with your ears, not with your eyes.” Since then, I’ve been obsessed with this idea and I’ve tried to use my camera like a jazz instrument, using simple and clean camera movements that are guided by what’s happening musically. However, in this film, the story weighs heavier than the music and I realized there were a lot of things Bebo had been involved in for which he had received no credit, if in fact he had been mentioned at all. That was one of many unfortunate results of having left Cuba when he did. So, I felt like I had to be true to the musical history no matter what, and some of the things said in the film hadn’t been told or written elsewhere. The third aspect, which to me is the most important, is the human story. To me, Bebo is a sort of Ulysses, a man who has lived three lifetimes. People see this nice old man who’s always smiling and who plays a wonderful piano. But I wanted him, and his family, to be able to speak. I wanted the film to be cathartic for them. After showing it a bit, it seems like it’s been cathartic for a lot of people outside the family as well. The biggest challenge was finding archive material. Bebo worked on many TV shows and yet nothing exists. There was not a single moving image available. Cuba has precious archives, but unfortunately a great percentage of the material has been thrown away or is being eaten by fungi in some vault. There may still be time to save a lot of material, but it needs to be done quickly. The second greatest challenge was financing the music rights. This film was hand-made, and if the Spanish authors’ society (SGAE) hadn’t collaborated, there would be no film. It blows my mind that I have to pay a bunch of lawyers money to use music in a film that is a tribute to the very author himself. The music industry constantly whines about the crisis, and I guess their plan is to make small doc filmmakers pay for it. What are your goals for the Tribeca Film Festival? Making it to Tribeca is already a goal in itself, and a wonderful surprise. As I was making the film, a lot of people didn’t understand what I was doing. Even after screening it, many still don’t get it. So being selected to compete in Tribeca has made a lot of people think twice. It makes me feel like I was not wrong. And that’s great because Bebo deserves the tribute. It’s also very important because a lot of people inside Cuba have worked hard to make this film happen because they see the value of this man’s contribution, not only to their culture, but to the world’s. So I’m hoping that Tribeca will be a launching pad that will help the film to be seen in many places and add to the poetic justice that the film has given Bebo. A scene from Faramarz K-Rahber’s “Donkey in Lahore.” Image courtesy of Tribeca Film Festival. Looking back, I remember being fascinated by shows on TV as a 5 year-old boy in Tehran, Iran. But it was the things that I experienced as a teenager, young adult and as a refugee that gave me reason to become a filmmaker. A puppeteering Goth wants to convert to Islam in order to get married with a young Muslim woman in Pakistan. Well, wouldn’t you want to know what was going to happen? My whole aim was to remain patient and not interfere with the lives of film’s subjects and the unfolding story. By sticking to these two rules I think I was able to tell the story in the best possible way. I would like to meet as many filmmakers as possible and learn more about their approach to filmmaking. Festivals are the best places to network and meet the audience so this is what I’m looking forward to the most.